Listen to Ms. Woodward, as narrated by Dr. Ineke Justitz, by clicking the play button below. 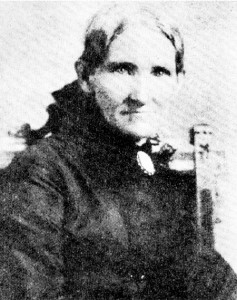 Mary Dodge Woodward was well informed for someone living in the isolated Dakota territory. In the two excerpts read by Dr. Justitz, Mary discusses the weather in the Dakota territory and the surrounding environment as well as solicitations and politics. She mentions the grain elevators resembling Bartholdi’s statue; Bartholdi’s statue was in fact the Statue of Liberty before it was officially named. In the second excerpt, Mary mentions the nomination of Harrison for President and Morton for Vice President in 1888; she made a reference to getting “some Tippecanoe in it” referring to the battle of Tippecanoe in which William Henry Harrison (the grandfather of the nominated Harrison Mary mentioned) was lauded as a hero. Special thanks to Dr. Ineke Justitz at North Dakota State University for being the voice of Mary Dodge Woodward.